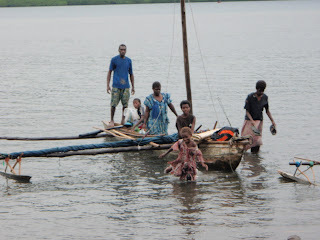 In Vanuatu, Christianity is the outer layer of belief. Presbyterian, Anglican, Catholic, Seventh Day Adventist are the predominant churches, but there is also a significant evangelical movement as well as cargo cults (arising after World War II, the belief is that AImericans will return bringing vast quantities of material goods to the islands). Though Christianity wasn't introduced to many communities until the late 19th century, it has had a huge impact. Before missionaries, we are told by the natives, the people were hunter/gatherers, lived in caves and the bush, and were always killing and eating each other. (Messengers wore special costumes to identify that they were not coming for war, but for a peaceful purpose, such as the exchange of brides.) The missionaries, we are told, changed that. They stopped the fighting and got people to live together in villages. They brought the Bible, English and French, reading and writing, clothing, and vegetables. The missionaries were brave folk. Until 1969, Vanuatu was cannibal country. Missionaries were an easy target because of the bad things whites brought - disease, forcible kidnapping to plantations in Fiji and Australia, and a ban on traditional custom activity. How the missionaries were able to have this enormous impact is hard to fathom. It's been suggested that the churches were an alternate form of status to the traditional, expensive chiefly system. These days, going to church is a big event. The choral music in the islands is, well, sublime, and there isn't anything else to do on Sunday. For visitors it is a way to get to know people and to pay them respect. Often there's a personal welcome song from the whole congregation, a flower garland, a free lunch, and a handshake from every member of the congregation following the service. At its best (a tiny gathering in a thatched hut where the whole service was song and dance including a rousing hymn called "Givem" while the collection basket was passed), it exemplifies the global fellowship of man. At its worst (an American guest preacher heading to Jerusalem on his sailboat with the message that the Kingdom of God will be established after a war between Israel and Iran "in the very near future"), it's eye-opening. Side by side with Christianity is a deeper, traditional world of spirits. A man who studied for three years in a Bible college showed us the magic pig stone he uses to wreak havoc on his enemies. ("My mother's brother taught me to summon it so it will uproot their gardens.") We were also shown a shark rock that overturns canoes - by the daughter of an Anglican priest. There is no conflict, they say, between Christianity and custom- they teach the same things. In some areas, custom has been virtually obliterated by a few generations of Christianity and the people need to go back to missionary journals to learn their traditions. In other areas - particularly Catholic French speaking ones, custom has remained strong. A handful of informed and articulate men told us that they had abandoned Christianity, and had returned to custom worship of nature and traditional gods. The dances we saw are rooted in the spirit world. Dancers and musicians undergo secret initiation rituals. Sequestered for a month or more in the bush, they learn not only their part in the dance and music, but where to find the materials for their costumes, how to prepare the special fires for making them, and how to dispose of the materials which become imbued with very strong power (strong enough to kill a person who is not authorized to touch them). This information is kept top-secret. It makes it a challenge to get answers to our questions ("Why do they paint their bodies black in this dance? ") and to bring back artifacts (the costumes are supposed to be destroyed after each use so they don't harm the uninitiated .) Though school was dismissed so the children could attend a custom dance festival,we were told that many parents kept their children away for fear of the black magic. People believe that black magic is the cause of untimely death and serious illness, though they pursue western medical treatment wherever they can. One dancer died from alleged black magic after a performing a highly sacred dance in Australia - considered taboo because the dance is so rooted to the spirits of a place. Black magic, it was speculated, caused the death of a government official who got in the way of some dancers while taking a photograph. And we have to admit, Ellen had been wrapping a large plaque that had been used in a custom dance when the Vanuatu earthquakes struck last week about 230 miles from where we were. Didn't feel anything but could it have been black magic? 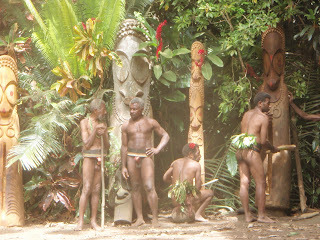 With regret we left Vanuatu October 14, headed for New Caledonia and then Australia. To the right, communication by outrigger canoe. Following up on Eve's posting, we are safe and sound following the quakes and tsunamis. Still in Vanuatu, we were about 1200 nautical miles west of the Samoa quake, and 3600 nautical miles east of the Sumatra quake. (A nautical mile is 15% longer than a statute mile, so these are substantial distances.) We did not feel, hear or see any impact. We also did not hear any warning on our marine radio which we keep on at all times. We don't really know very much except our own experience and messages from the family: we have had 30 minutes on the internet in seven weeks and seen a current Vanuatu newspaper once or twice in the same period. A tsunami is generally not felt just offshore. If you have just a few minutes to pull up your anchor and get to open sea, a boat should be fine and not notice much of anything. When you are at anchor, you are usually in close contact with people. A place where a boat can anchor is a valuable harbor for the natives as well, and consequently, it is where people live. We were able to tune into Armed Forces Radio and hear NPR's All Things Considered - a very rare event for us- and heard a piece speculating about how tsunami warnings might get spread in this part of the world. Which gives us a chance to offer you our thoughts about communication of important messages here. Within ear or eyeshot, news travels incredibly fast by word of mouth, walking, and canoe. Example: arrive at new village, give some fresh caught fish to a couple of guys who paddle out to your sailboat to say hello (see the photo above). Ten minutes later, as darkness falls, more guys paddle out because they learned there might be some fish aboard. Onshore, people have a traditional set of emergency signals kind of like a musical Morse Code that they play on hollowed logs to spread word from village to village - someone is sick, someone died, an event is about to begin. (See the other photo showing elaborately carved slit-gongs/tam-tams used for this purpose). The message is relayed from village to village that way. Between islands without phone or radio communication, they set fires to summon help (such as, my wife is expecting a baby soon, please send a boat to come get her). Wisely, early on the villagers had formed a thirty man convoy to carry the patient to the next village (three hours away for a healthy adult without a load). There was a medical dispensary there where he received some medication that provided some alleviation of the symptoms. We received several updates via the trail grapevine during this period of time, people running and paddling, back and forth, back and forth. It works for them. Needless to say, it is very educational for Westerners who are used to using technology to "get results". Doesn't really work in remote areas around here. Skipping several generations of technology, cell phones seem to be a tremendous boon. Things seem to work a bit more reliably where they are available. It's a sobering experience when places we have visited are hit by natural disasters or when we contemplate what might have happened if it had been us with a medical emergency or a tsunami in a remote place. We take lots of precautions but ultimately these risks are part of this adventure. Our thoughts are with the people we met in 2007 in American Samoa (Pago Pago) and in northern Tonga (Nuiatopotabu), which we understand were hard hit. You can reread our blog entries from those places.